It's a simple statement of personal preferences, right? "I like bananas more than lemons." "I think today I'd rather have tamales than gyros." What power could there possibly be in stating that you like some things more than other things? Heck, these things are not even opposites. Look at the first one -- don't processes and tools exist to help individuals interact? 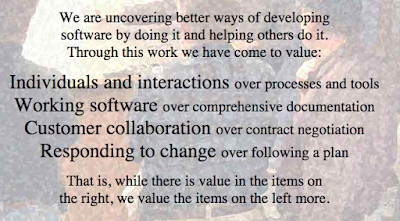 Try the second one -- what about "writing documentation" would keep software from working? Okay, the last two have some real conflict, but that's 1/2 of the preferences listed. My reading of this document and interactions with some of the originators has long led me to believe that this is truly a powerful document. It goes well beyond personal beliefs and preferences. What I see listed in the four simple category statements is a powerful set of decision-making criteria. If left-side items and right-side items are in agreement, then there's nothing to see here. We can move on. Tools that actually helps individuals interact are very welcome. 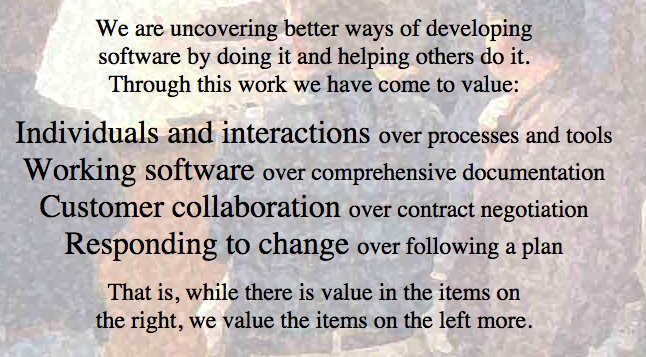 I don't know many agile teams where they don't have processes that bring people together (pairing, mobbing, joint ownership of code and work assignments, even stand-up meetings and teleconferencing software). These are clearly allowed. But when there is a conflict, the winner is pre-chosen. If a tool is introduced whose purpose is to eliminate or limit interaction between team members, we choose in favor of interactions. When we can "just enter it in this form and avoid a meeting" then we're likely on shaky ground. If we add tools that insist on individual work assignments, then we're on shaky ground. In those cases, the tools lose. We should consider deleting them from our system if we can't modify them to support interaction. A plan that helps us collaborate together and improve the product on a regular basis is totally fair. However, if a drive to comply to the plan prevents us from making use of feedback and collaboration, then the plan has to bend. Collaboration is the pre-chosen winner. If we have to choose between finishing the software and finishing comprehensive process documentation, we choose the software. The winner in the contest is pre-chosen. Note that user documentation is generally part of the product (see the RW/BS line). "While we value items on the right, we value the items on the left more" is rather a lot like "I value my safety, but I value the safety of my children more." It's rather a lot like "I value my opinion, but I value your freedom of speech more." It's a solid statement that those things valued the most will not be compromised by, or for, the things less valued.